The American Eskimo Dog temperament makes her a joy to own as a pet. She is also appropriately named since her coat is of the purest white, like snow. The American Eskimo Dog size can vary. She comes in three different sizes, like a poodle. That's right – there is also a Toy American Eskimo Dog and a Mini American Eskimo Dog! The Toy American Eskimo weighs between six and 10 pounds and stands between nine and 12 inches tall. The Miniature American Eskimo dog stands at between 12 and 15 inches tall and weighs 10 to 20 pounds. The American Eskimo Dog, or Eskie, was initially bred as a guard dog and a herder in Germany. She is a descendant of the German Spitz. Because of her watchdog background, she has no problem barking at anyone and anything that crosses her path. She is not aggressive, though. She is a sweet dog who wants to keep her master safe. Spitz breeds, including the Eskie, were brought to the U.S. by European immigrants in the early 1900s. Protective – As mentioned earlier, she was bred to be a watchdog. This trait has remained with her through the generations. Intelligent – She's a smart dog, which makes her easier to train. Friendly – Just because she's quick to bark at you doesn't make her any less companionable. The Eskie is also a skilled communicator. She'll often use her eyes to show you what she wants. For example, she'll look at her toy, then look at you, signaling that she wants to play. Her protective trait makes her a bit of a barker. But, her intelligence makes it easy to train her on the right and wrong times to bark without a problem. The Eskie is a friendly dog, but she may become irritated with young children who are not as gentle. Supervise young children and teach them that tight hugs might not seem as friendly to the dog. In the late 19th century, the Eskie enjoyed a circus career! With her bright white coat that was made for the spotlight and her agility for performing stunts, she was a natural. The Eskie is the first dog known to have ever walked a tightrope! Today, Eskies can still perform a good deal of tricks with ease. 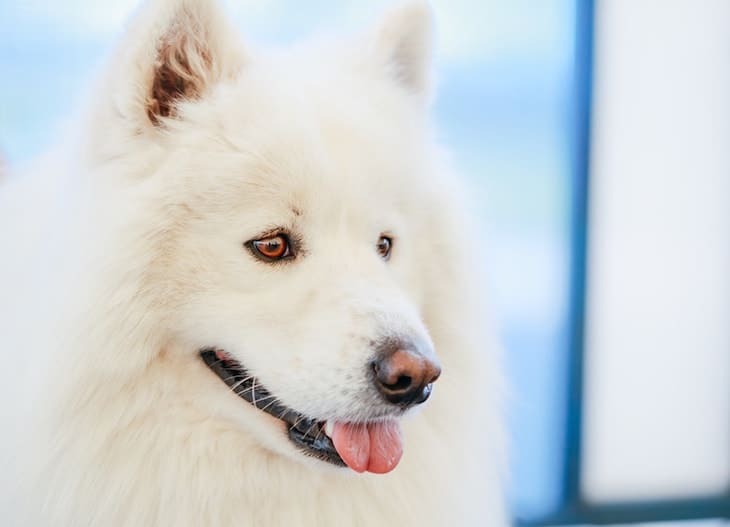 Eskies can come in two colors: the more common white and “biscuit cream.” The latter is a mostly white coat with “biscuit”-colored fringe. You can train an American Eskimo Dog as early as eight weeks old. An Eskie is like a sponge, and she'll absorb more of what you teach her the earlier you start. She's so smart that she can often learn what to do by merely watching other dogs. An Eskie is also eager to please her master, which makes training her much more manageable. Don't forget; she used to be a circus dog. She can learn many tricks and do them well, as long as she has a dedicated teacher. Socialize her with other people and animals as early as possible to prevent potential behavioral problems later on. You might think that with a coat like that, grooming an American Eskimo Dog is a chore and a half. In fact, for such a fluffy coat, it's surprisingly easy to keep clean. However, something to remember is that for the American Eskimo Dog, shedding is continuous. Brush her two to three times a week to prevent matting and to clean off the hair she has lost. Collecting it in a brush is far better than trying to clean it off the floors and furniture. You only need to bathe an Eskie every few months. Any more than that and her skin can become dry and irritated. Exercise is essential for an Eskie because of her high level of intelligence. If she's inactive and unchallenged, the American Eskimo Dog temperament will force her to find ways to entertain herself. This entertainment may include chewing on things like your shoes or furniture. Despite having a thicker coat to keep her warm, you may want to exercise her inside when possible even in colder regions. The Eskie prefers to be with her people, rather than left to her own devices in the yard. There is no guarantee that when you purchase or adopt an American Eskimo Dog puppy that she won't get sick. That's why it's important to know the kinds of diseases that can affect this particular breed. Hip Dysplasia – This is a fairly common condition. Hip dysplasia is genetic, and it happens when the thighbone doesn't properly fit into the hip joint. This can lead to arthritis later on. Juvenile Cataracts – This eye condition typically affects Eskies younger than six years old. Experts believe the condition is hereditary. Legg-Calve-Perthes Disease – This is another hip condition. Symptoms usually show up in puppies aged four to six months old, and surgery can correct it. Progressive Retinal Atrophy (PRA) – This is an eye condition wherein the retina gradually deteriorates. Some dogs develop night-blindness, while others go completely blind. Most dogs, however, adjust well to their limited vision or blindness. If you're looking into American Eskimo Dogs for sale, you probably will have interest in the American Eskimo Dog price. On average, you should expect to spend between $600 to $1,200 for an American Eskimo Dog for sale. The price range for a Toy American Eskimo Dog is slightly less, averaging $600 to $800 per puppy. If you want to support an American Eskimo Dog rescue, you may want to look into Eskie Rescuers United. Here, you can buy something from their store to support the organization – including wine! 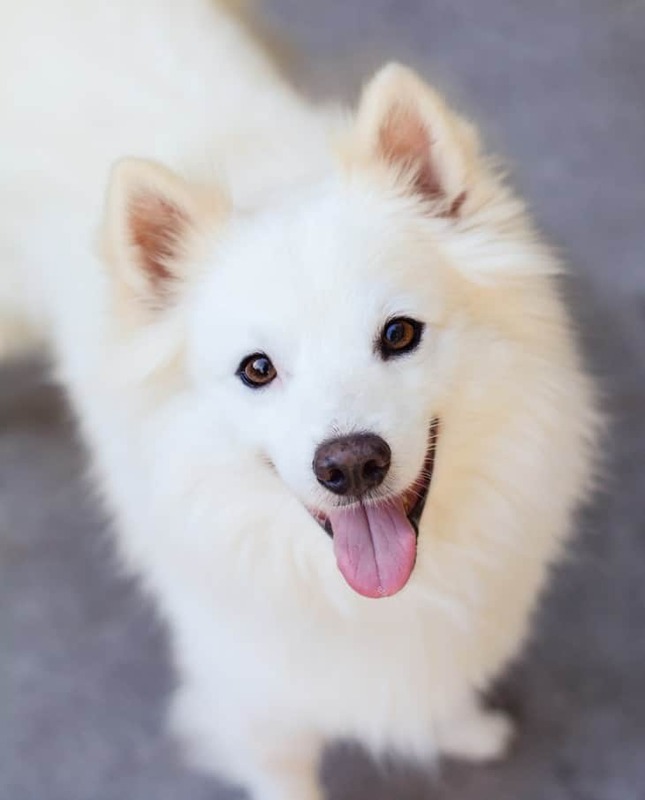 Most importantly there are available American Eskimo Dogs for adoption listed. This type of information is not always availabe for Rescue/Adopted dogs. So it's great when you get it. When considering purchasing an Eskie from a breeder, your first choice should always be American Kenne Club (AKC) Puppyfinder. This is because you can usually trust a breeder that the AKC promotes. These breeders are likely to follow the rules. They are certified. And they refrain from breeding animals with genetic issues. However, if you choose not to use AKC's Puppyfinder, do your research to ensure you're doing business with a reputable breeder. The American Eskimo Dog temperament makes her an excellent watchdog, but she's not aggressive. She's friendly, smart, and easy to train, but tight hugs from younger children may not go over well. The Eskie is a healthy breed, but she is still prone to eye and hip issues. For this reason, be sure to thoroughly research your breeder before spending any money on an Eskie puppy.